For nearly 50 years, the Oroville Dam has provided critical flood control, valuable hydroelectric power and essential irrigation as a key component of the California State Water Project. But in February of 2017, all of that changed, and the Dam quickly transformed from a powerful resource to a potential threat. After a series of massive rain storms tore through the state, the Dam’s operators noticed significant damage to the main spillway, which is the primary channel used to prevent flooding. Due to the damage and the ongoing heavy rains, the main spillway was no longer able to drain the water from Lake Oroville quickly enough, and as a result, the Dam’s emergency spillway went into operation for the first time since the Dam opened in 1968. However, headward erosion of the emergency spillway meant that there was a serious possibility that the Dam’s concrete weir would collapse and cause massive, uncontrolled flooding in the downstream areas around the Feather River. Emergency protocols quickly went into effect, and nearly 200,000 people were evacuated. Fortunately, the water level dropped, the weir held out, the crisis was averted, and residents returned to their homes. But the damage to the Dam was grave; both the main and emergency spillways require extensive repairs. IBEW Local 1245 members have been on the scene at the Dam since the very beginning, even before the water hit the emergency spillway. Initially, several crews from PG&E were called in to remove the transmission towers and wires that were in the emergency spill channel. 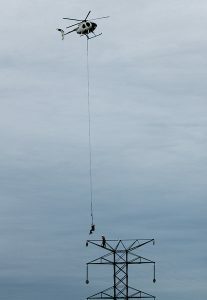 They utilized a helicopter to take down the power lines and towers, and completed the work the day before the lake water entered the emergency spillway. 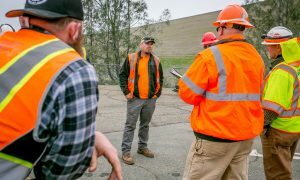 The PG&E crews were then tasked with building a shoo-fly around the spill channel – which consisted of nine locations with 13 light duty steel poles — to restore power to that circuit. Once the spillways were stabilized and the area was deemed safe, Local 1245 Outside Construction crews were brought in to help with the complex restoration work, which may take months or even years to complete. The Utility Reporter caught up with Emerson and his crew a couple weeks after the crisis. They were working east of the spillway damage, at the base of the dam itself, and Emerson detailed precisely what was going on at the time. The crews used a helicopter and sky crane to wreck out some of the vacant towers that were being undermined by the spillway erosion. Given the exceptionally steep terrain, the helicopter was a vital asset to the crews. What would have taken 45 minutes to traverse in a land vehicle took less than a minute in the chopper. The main contractor on the scene, Abercrombie Pipeline Services, had just become signatory to Local 1245 shortly before beginning work on the project (Outback Construction also assisted with the shoo-fly by digging holes into the bedrock). A number of the IBEW members working on this job came in from other areas outside of Local 1245’s jurisdiction. Most of them had never worked together before, and few had even encountered a job quite like this one. 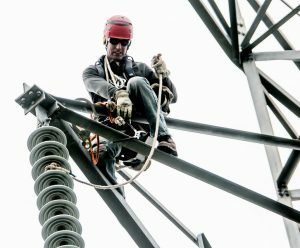 But they all had one thing in common – as IBEW linemen, they were able to draw upon their extensive skills and training, and quickly formed bonds that enabled them to maximize their effectiveness on the job.